This is the front of the ASR 33 Teletype. The remote/off/local switch is in the front right, the paper tape reader in the front left and the paper tape punch in the back left. Remote is to operate talking to a computer and local is to operate without a computer. You can punch or print a tape off-line to save computer time when access to the computer is limited. 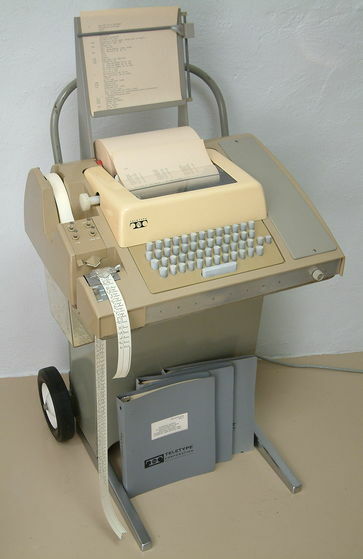 The wheels and handle were an option to allow the teletype to be more easily moved. In front of the base is the three volume maintenance manual set. A set of 11x17 schematics was also part of the maintenance material but I don't have an original copy.